The Remodeling Pro has just completed the Brown Project. 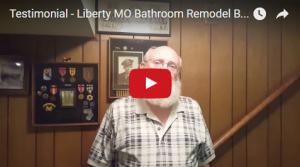 A renovation of two bathrooms in a ranch style home in Liberty MO. The makeovers featured shower walls by The Onyx Collection a Midwest company based in Bellevue, KS. The Onyx Collection made in Kansas is made of 63% flame resistant hydrate crystal and the other 37% is Onyx special polyester resin, developed over 23 years in business. Onyx comes in 80 colors (matte or gloss). Onyx was chosen for the Brown remodel because it is beautiful, easy to install and economical. Finally Onyx is much easier to clean. To find out more about this home renovation project or Onyx call The Remodeling Pro (816) 268-9800 or (913) 307-5050.